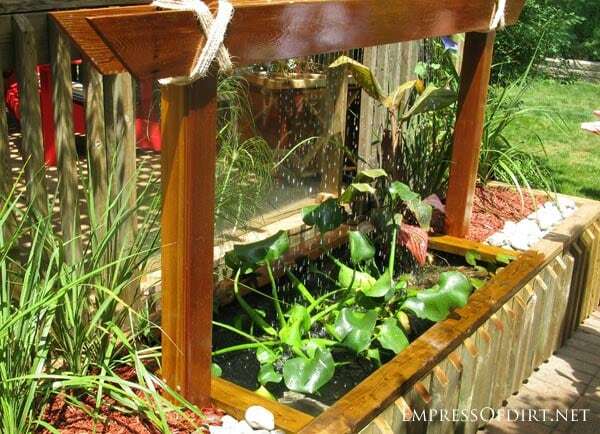 Would you like a fish pond in your backyard? 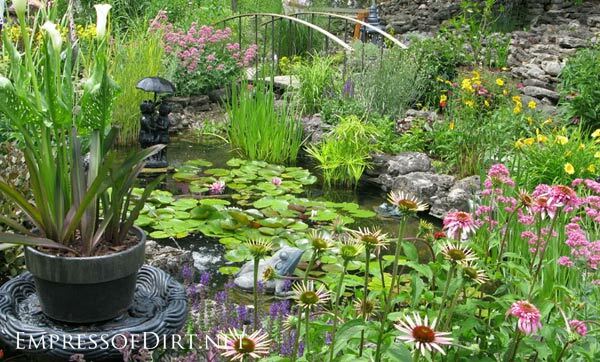 These garden pond ideas feature a range of styles for every budget. 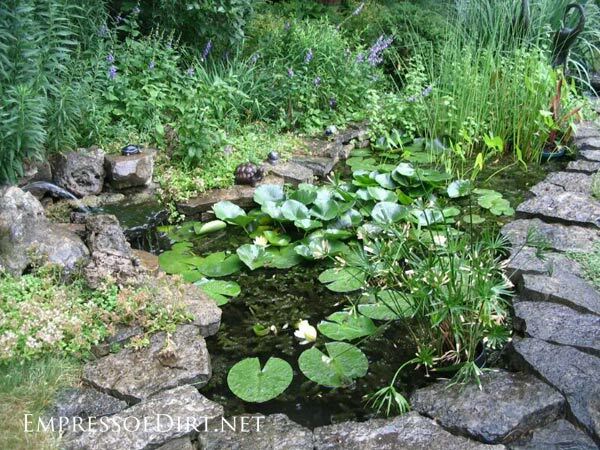 A backyard pond can be above-ground or in the ground. I’ve provided lots of pictures for you to gather ideas. 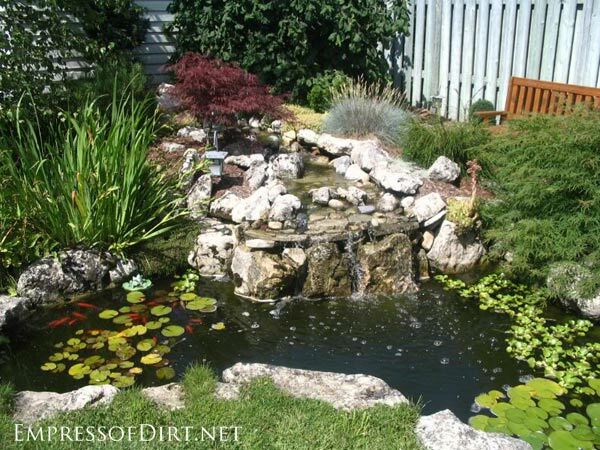 From there, use the tutorials for building the pond or water feature you want. It’s hard to believe that garden ponds were fairly rare not so long ago. Now they are considered an essential part of most backyard gardens. I built my first backyard pond about twenty years ago. 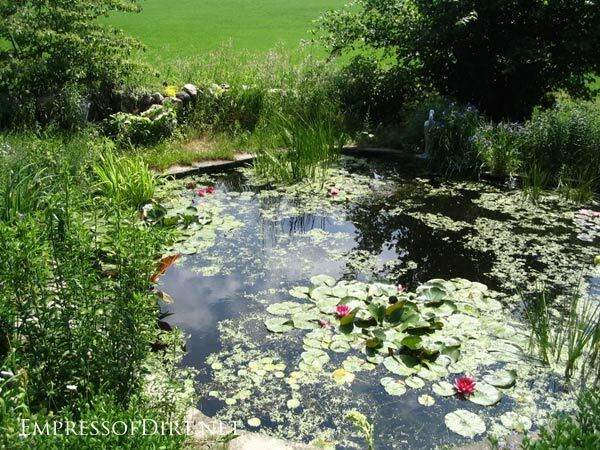 After seeing a massive in-ground pond on a rural garden tour, I was hooked (that’s it in the photo above). The sound of the waterfall was enticing. Dozens of fat fish frolicked in the waterfall. Dragonflies dipped down to drink and then zotted off into the garden. Squirrels would lean over the edge, taking sips of water with their little red tongues. Water spiders danced across the surface. Water lily stems held their flowers high above the surface, leaning their pink and white petals toward the sun. Frogs sunbathed and snoozed on the floating leaves. That pond was clearly the heart of the garden and it was just beautiful. My own first pond was not nearly so grand. In fact, it was simple preformed pond that I buried in the ground, probably not more than 500 gallons. I added a little makeshift waterfall and a couple of aquatic plants. But that was enough to bring the entire garden to life. 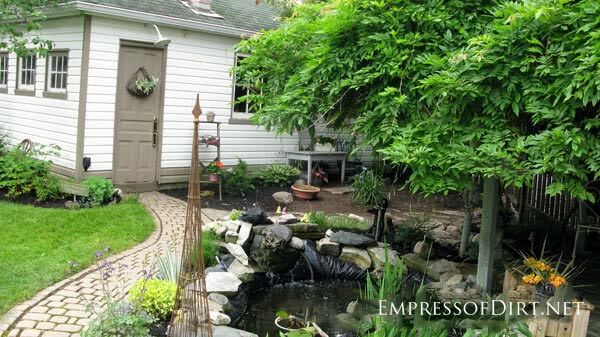 What I wasn’t expecting was how a pond—no matter what size—truly transforms a space. Suddenly my little perennial and veggie garden became the hub for all living things in the area. All creatures great and small made use of the fresh water and chose their nesting spots nearby. As someone who loves not just plants but the living things that rely upon and sustain them, this was a wonderful thing. 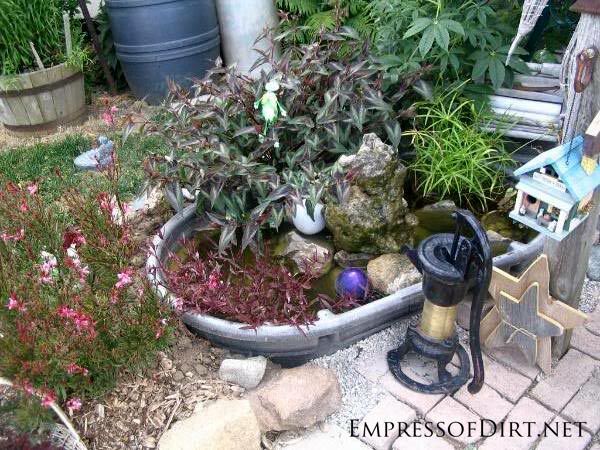 Since then, I have built several more ponds: in-ground ponds with waterfalls, above ground ponds in containers, bathtub ponds, patio container ponds, and miniature desktop ponds. 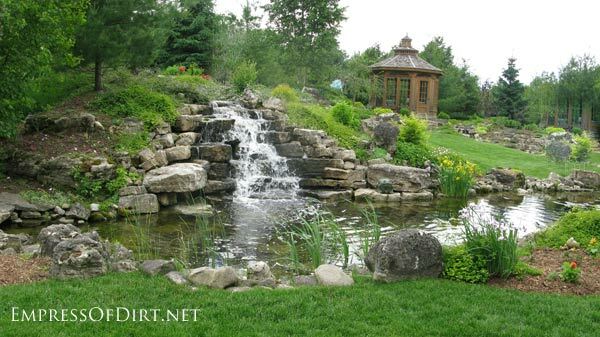 What you build will depend on your resources: the space available, your budget, how big or permanent you want the pond to be, if you prefer a naturalized pond or want something with more of a human touch, and what you want the pond to do for your space. 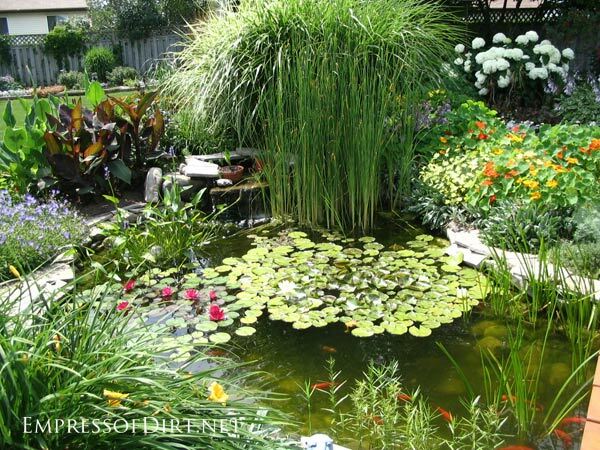 I encourage you to first browse the Backyard Pond Photos below to get inspired and find the type of pond you want. 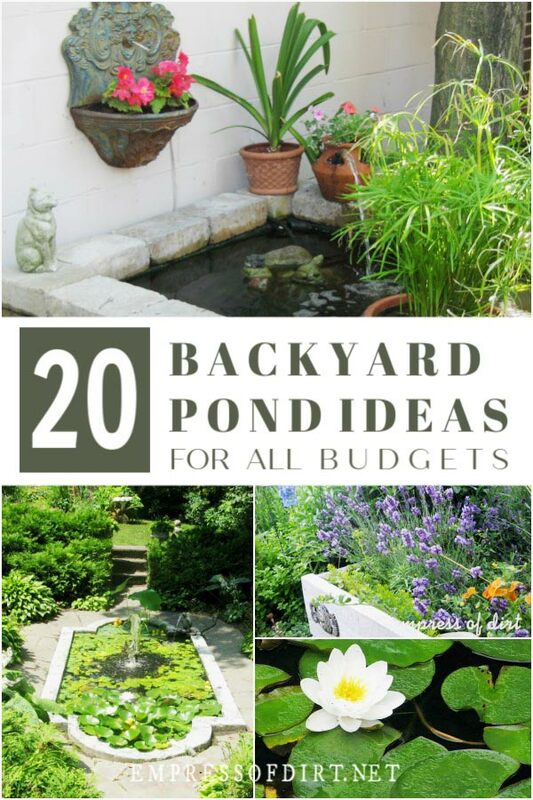 From there, I have provided tips for everything from advance preparations to building your own beautiful pond. I’ve collected ideas, ranging in size from small containers to very large ponds that cover all budgets and styles. 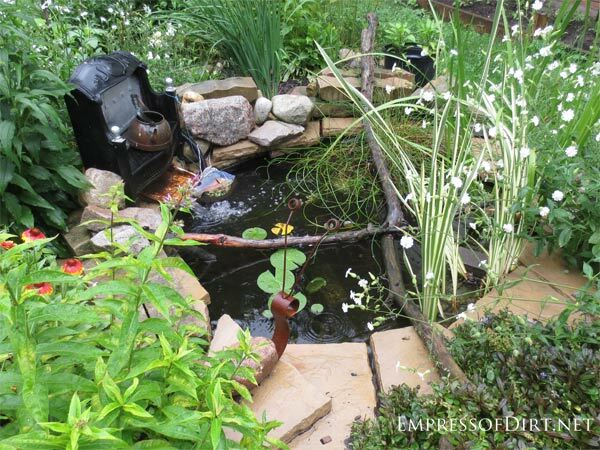 I took these snapshots on garden tours and in my own garden, so don’t expect prize winning images, but I think you’ll find lots of ideas for your pond project. Start collecting ideas by pinning your favourites to a Pinterest board. 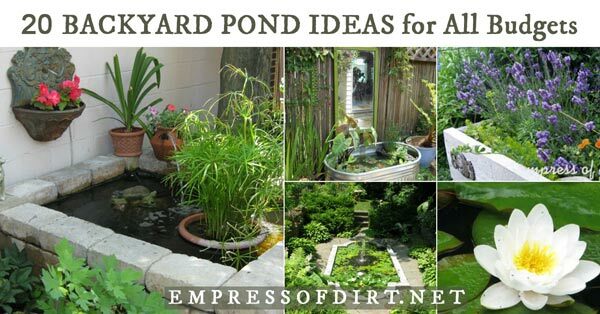 I’ve got my Pinterest pond idea board here. Once you know the style you’re after, you can start the real work of planning and building. And attracting frogs. Some of the product links below go to my affiliate’s account at Amazon.com. I encourage you to try and buy used first, or seek out local end of season sales for the best deals. I think the secret to how great this pond looks is a) the use of pavers, and 2) having it against the brick wall. 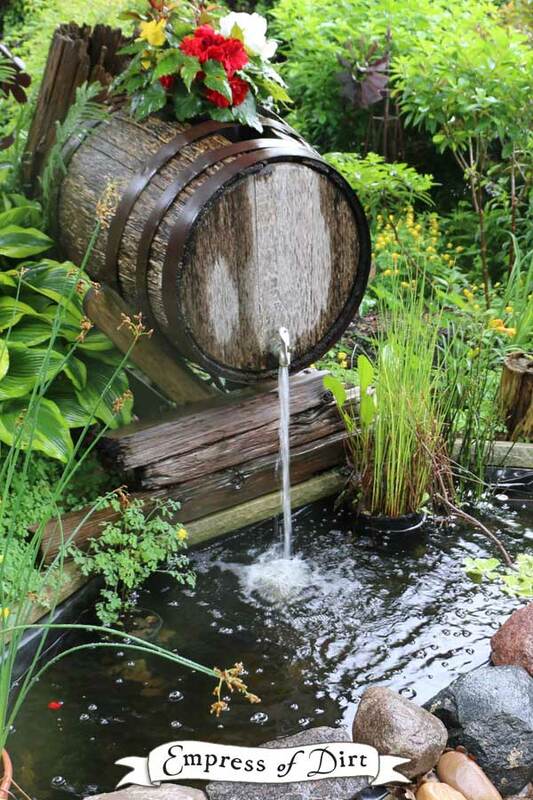 These whiskey barrel ponds with liners can be purchased as kits. Check the shop listings carefully to be sure it’s the size you want: some of them are doll size! If you can wait until the end of the season, you might be able to find one for a great deal. 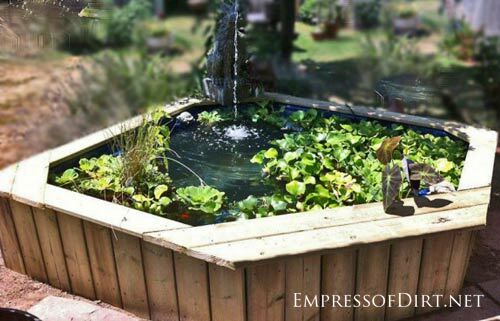 This pond was created by a friend of Empress of Dirt on Facebook. 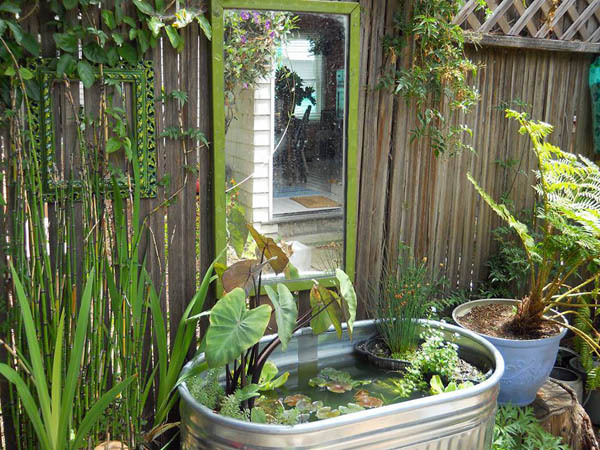 Her husband built the wood frame around their old hot tub to create this little pond. Stock tubs come in plastic and galvanized metal. You can find them at farm supply stores. 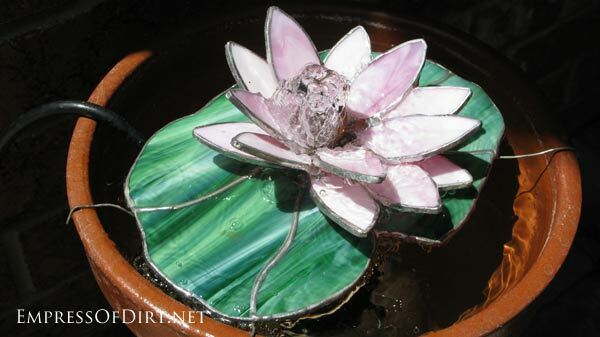 The metal ones are gorgeous but a bit pricey for a little pond. Be sure you choose a style that is water-tight. Got an old bathtub? 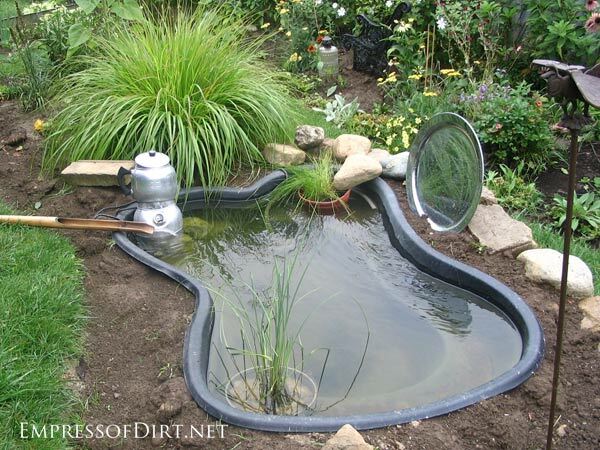 Turn it into a patio pond! This one is from the garden at my previous home. We loved having the pond near the house where we could enjoy it. I took a pond form and built the raised bed to fit: the instructions are here. Conveniently, it worked for a 4×8′ structure. 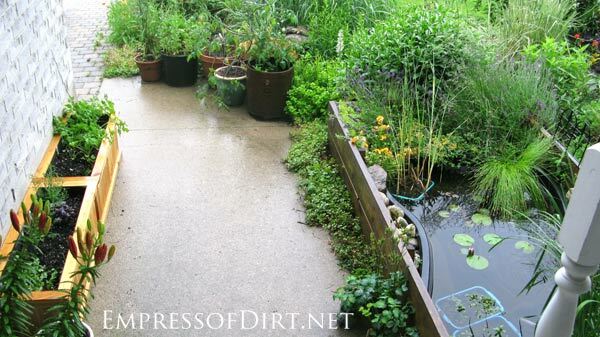 This was the very first pond I installed in the back garden at my previous home. This was the pond that told the wild things, hey, there’s a great garden here and fresh water! Come enjoy it! And they did. And yes, I concealed the pond form with flat rocks. 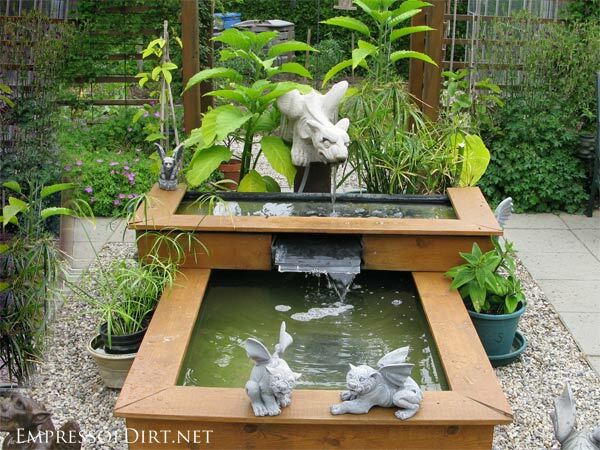 You can buy pond forms like this one at any home and garden store. This is the pond at my home today. I found a pond liner kit with a pump for 70% off and, because the soil is so sandy (easy to dig), I had it installed within 2 hours. The branches draped across the pond keep the birds of prey from eating my beloved fish. I saw this water wall on a garden tour. If you have a sheltered area without much wind, it’s a neat idea (wind would blow too much water away). You can see how it’s made here. Waterfalls can look pretty silly (unnatural and out of place) unless you have a natural hill to work with beside your pond area like this one. 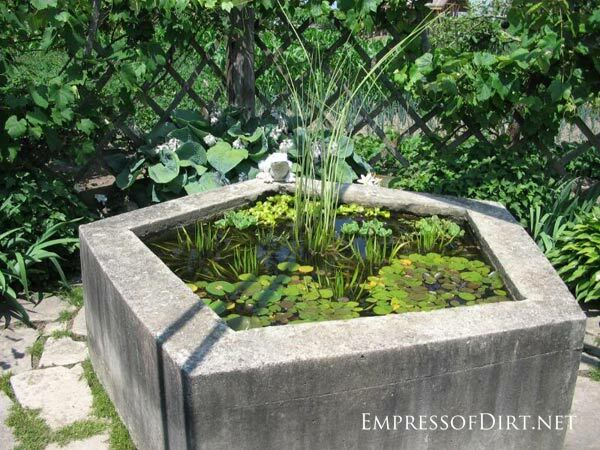 This was actually the first homemade garden pond I ever saw. It was gorgeous. I went home determined to create my first pond. And I did. It is a badge of honor when the wild things settle in. If they don’t, your pond is too clean! Frogs are honoured guests in my pond. 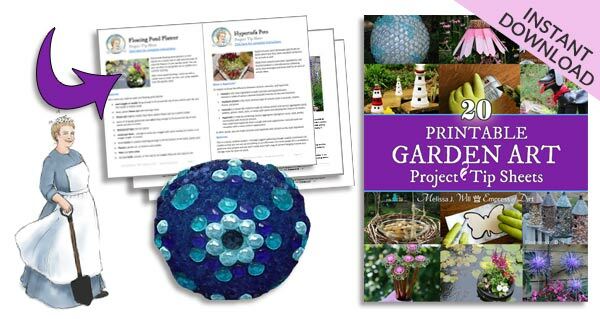 I hope you found some ideas you can use in your garden. 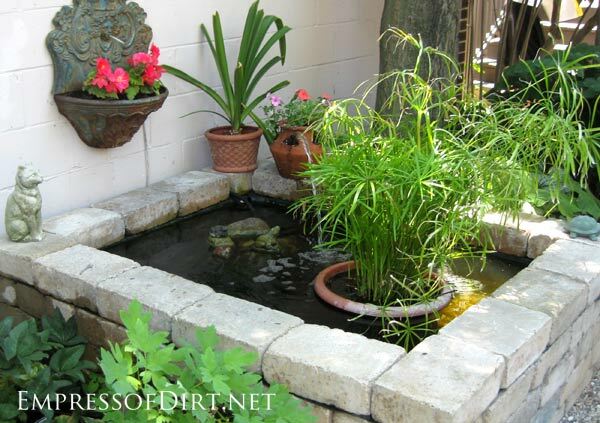 If you’d like tips on how to set up a small backyard pond, see my how-tos here. 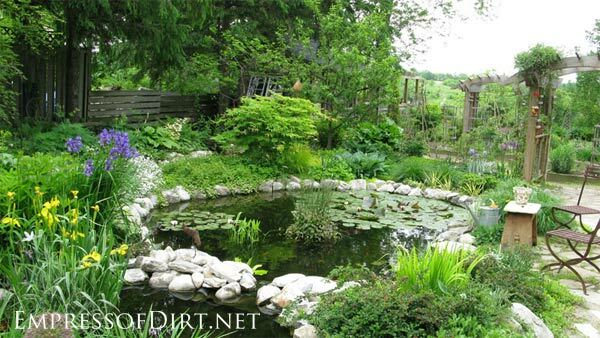 1 How much does it cost to build a pond in your backyard? 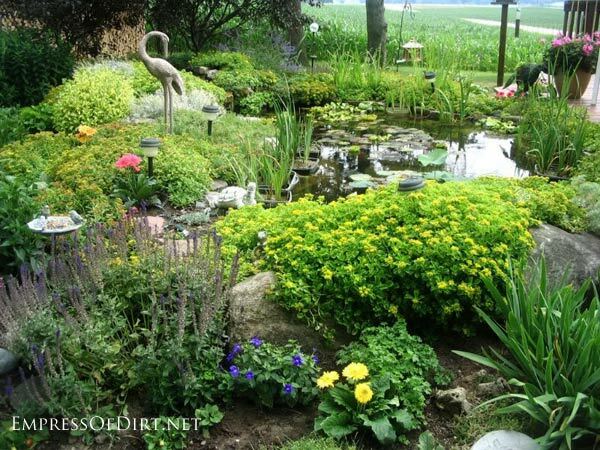 This will depend on the size and depth of the pond, if you need to buy materials like rocks to line the pond, and the cost of any landscaping and plants both for the pond and surrounding it. You could build an inground 4×6-foot pond using a pond form and a submersible pump for a few hundred dollars. You can do it even cheaper if you’re willing to search for a used pond form at yard sales or in online classified ads. 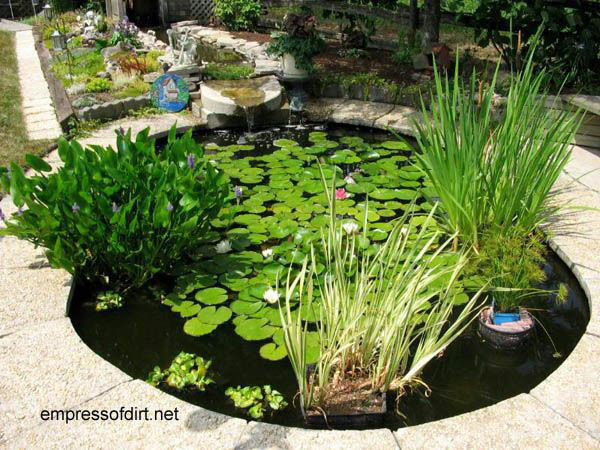 An 8×10-foot inground pond, made with a pond liner kit, complete with a waterfall and 2000 gph (gallons per hour) pump, lined with rocks from a landscaping business, and stocked with aquatic plants and goldfish could cost between $2,000 and $5,000 US. A larger in-ground pond installed by professionals could cost $10 to $20,000 US or more. I’ve seen magnificent 20×50-foot garden ponds that cost $100k or more. I’ve also seen others that size and budget that were …not good! That’s why it’s good to have an idea of what you want first, and, if hiring help, be certain the builders share your vision and your budget will cover it. 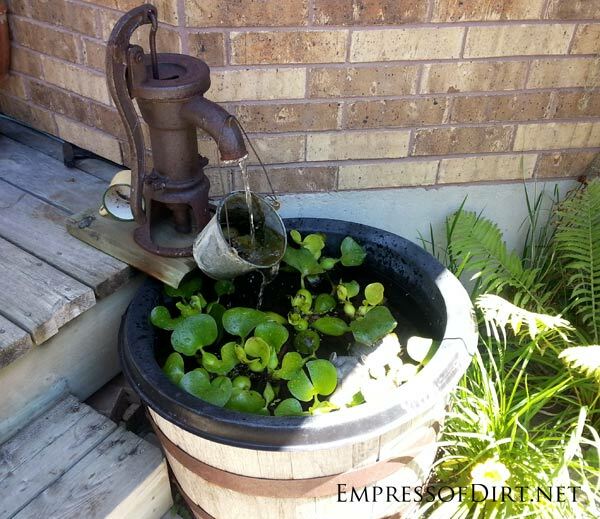 You could also build a little patio container pond in an old barrel with a liner and small fountain pump for $50 US. 2 How deep does a fish pond need to be? Two feet is considered a good minimum depth for the health and safety of pond fish. There are formulas for calculating how much water space each fish should have. I like to allow at least 2 cubic feet of water per fish. If you are in a cold climate like I am, you have to also plan for overwintering the fish. I use both pond heaters (de-icers that float on the surface and stay heated all winter long) and I keep the recirculating pumps running. Cold water fish like goldfish go dormant in the cold weather, staying deep down in the pond. They are safe from predators the deeper they can go, and they will not freeze so long as the water is never allowed to ice up or freeze over. 3 How deep does a frog pond need to be? 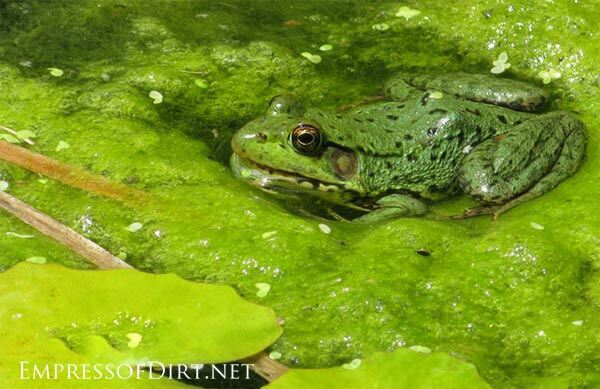 Frogs and fish have similar needs in backyard ponds. It’s best if there are deep areas (at least several feet deep) along with shallower areas at least two feet in depth. Greater depths also keep racoons and other hungry creatures from being able to reach into the water and grab a snack. Just like fish, frogs will surive the winter if the water continues circulating and is never allowed to ice up or freeze over. It is also good to let the bottom of your pond naturalize with some mud and dead matter, providing frogs with places to hide and rest. 4 How do I keep my pond water clear? It can be a challenge to keep pond water clear. The location of your pond is one big factor. Tree leaves can cause lots of trouble and so can hot sun, which makes algae spread like crazy. Keeping your pond clear of debris, with the right strength of recirculating pump is good preventative care. Barley straw is shown to do a good job slowing down or preventing the growth of algae as well. If you have too many fish for the volume of water, their waste can also dirty a pond. More is not more with fish! If your water is getting murky, often from algae dispersed throughout the pond, you can try my water filtering trick. 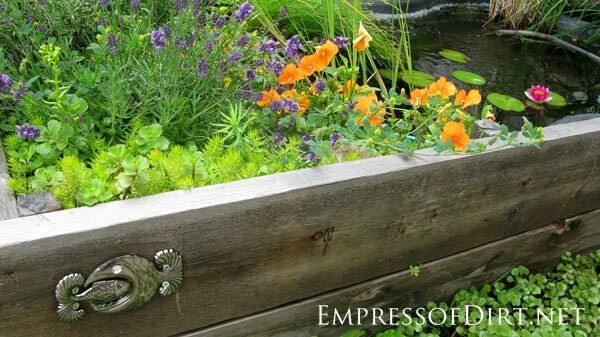 The Garden Pond Tips and Ideas section has lots more detailed advice. Any tips for converting an old pool into a pond? I’ve got no first-hand experience with that. Have just seen it done, of course. But I’m sure you’ll find help online. So Melissa, which pond is yours? I’m dying for one but have nowhere to put one. Hi Juan, Sorry, I don’t have any info like that here. I’m sure any stone or pond shop or site could help. Great post! Ignore Joe. Your site looks great. I have always wanted a small pond in our backyard. We have a swimming pool and a really large backyard so there is plenty of room. So here is a question for you: if we don’t run the pool pump all the time and keep the chemical level up on the pool we get water moccasins in the pool so how do you keep the bad critters out of the pond? I don’t need my dog or grandkids getting bit by something like this. Cindy, In short: I have no idea. I have a feeling the snakes are smarter than any idea I could come up with. But good luck! Cindy Meisenheimer, we live at the bottom of a large rock bluff in Tennessee, and the name for this big bluff is “cotton-mouth hill”…… We have 13 acres in the middle of this snake infested area. Lately (last 2 yrs) we have seen a lot of King Snakes which are famous for killing the poisonous snakes…….and, we’ve noticed the cotton-mouth population has been waning quite a bit. King Snakes can be bought online. I don’t know how you could contain them “if” you do buy a couple……is there a fence around your pool? King Snakes are great “good guys” and there is absolutely nothing to fear from them. I’ve been sitting beside a flower bed and a King Snake slitters pass me so close I could reach out and touch him. Great post! Makes me want to go out and play in the water! Lovely ponds and plantings, thanks for the inspirations. Thanks, Barb! Cheers for gardening season beginning!